Persistent segregation, plus deindustrialization and declining in job quality across the region, has created stark and sustained obstacles to equal opportunity and equal outcomes. 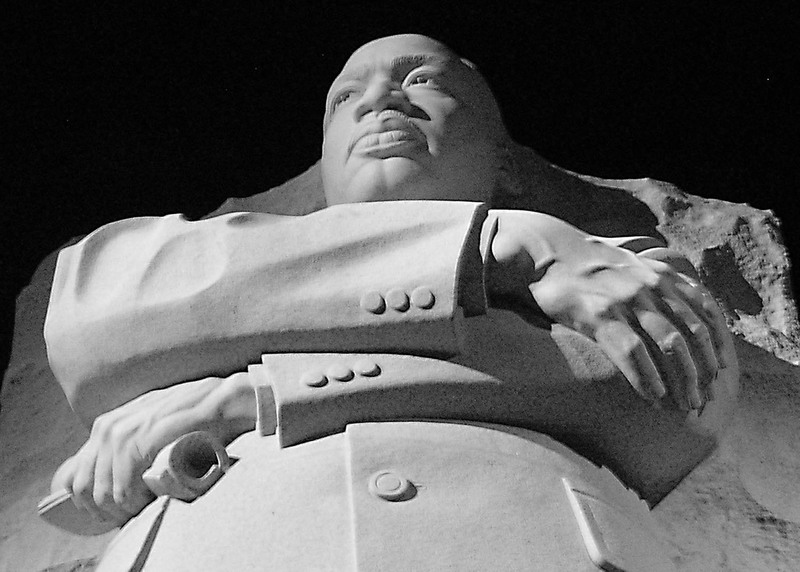 As we mark Martin Luther King Day, it is also worth underscoring just how far we need to travel — in Iowa and in the nation — to achieve Dr. King’s aspirations of true and substantive racial equality. Nationally, the last half-century has seen some progress in African-American educational attainment, wages, and incomes. But gains on other fronts — including home ownership, wealth, unemployment, and incarceration — have been elusive. Regrettably, Iowa (and its upper Midwestern neighbors) remain among the starkest settings for racial inequality across a number of dimensions. Historically, Midwestern and rustbelt metropolitan areas have always been among the segregated places to live. Indeed black-white segregation in Iowa’s metro areas has persisted across the last generation and — in the Iowa City metro — has actually worsened since 1990. This, coupled, with the sustained impact of deindustrialization and declining in job quality across the region, has created stark and sustained obstacles to equal opportunity and equal outcomes. The result is a jarring juxtaposition: While Midwestern metros (Des Moines, Madison, Minneapolis) typically crowd the “best places to live” lists, they are also among the very worst places to live for African-Americans. In one recent analysis, ranking the states by an index of racial inequality, Iowa and its immediate neighbors (Wisconsin, Minnesota, South Dakota, and Illinois) were the top (worst) five states. Below, I have calculated Iowa’s position (rank among the states) across five key dimensions. For poverty, income, unemployment, and homeowners I used the Census Bureau’s 2013-2017 American Community Survey (pooling five years of data, given the size of the African-American sample in Iowa, provides a more reliable estimate); for rates of incarceration, I rely on the ongoing work of the Sentencing Project. 1. Although Iowa’s unemployment rate is low, the white-black gap is persistent. At 7.2 percent, the African-American unemployment rate is more than double the rate (3.2 percent) for white Iowans (2013-17). We are one of 16 states to reach this dubious threshold; the ratio of white-to-black employment in Iowa is the eighth worst in the country. 2. African-American household median income in Iowa ($30,505) is barely half white household income. On this measure, we rank seventh worst in the country. 3. On poverty, the disparity is even starker. The African-American poverty rate in Iowa (34.1 percent) is more than triple the white poverty rate (10.0 percent). We rank sixth worst in the country. 4. Almost three quarters (74.1 percent) of white Iowan heads of households own their homes, almost triple the rate (27 percent) for black heads of household. On this metric, Iowa has the seventh worst disparity in the country. 5. One of every 17 black men in Iowa are in prison, a rate of incarceration that is the third worst (behind only Vermont and Oklahoma) in the country. 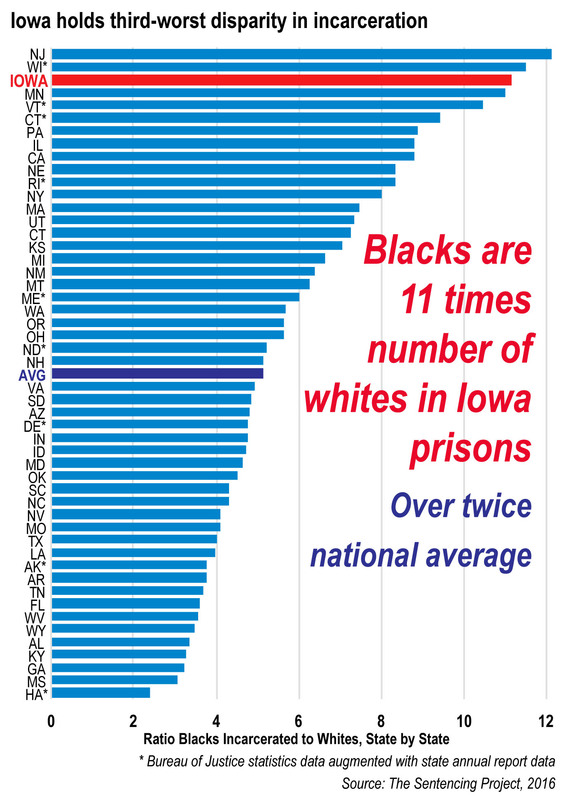 The ratio of black-white incarceration in Iowa is 11.1: 1 (for every white adult in prison there are 11.1 black adults in prison), again ranking third worst (behind Wisconsin and New Jersey).